Long non-coding RNAs (lncRNAs) have crucial roles in various biological regulatory processes. However, the study of lncRNAs is limited in woody plants. Catalpa bungei is a valuable ornamental tree with a long cultivation history in China, and a deeper understanding of the floral transition mechanism in C. bungei would be interesting from both economic and scientific perspectives. In this study, we categorized C. bungei buds from early flowering (EF) and normal flowering (NF) varieties into three consecutive developmental stages. These buds were used to systematically study lncRNAs during floral transition using high-throughput sequencing to identify molecular regulatory networks. Quantitative real-time PCR was performed to study RNA expression changes in different stages. In total, 12,532 lncRNAs and 26,936 messenger RNAs (mRNAs) were detected. Moreover, 680 differentially expressed genes and 817 differentially expressed lncRNAs were detected during the initiation of floral transition. The results highlight the mRNAs and lncRNAs that may be involved in floral transition, as well as the many lncRNAs serving as microRNA precursors. We predicted the functions of lncRNAs by analysing the relationships between lncRNAs and mRNAs. Seven lncRNA-mRNA interaction pairs may participate in floral transition. This study is the first to identify lncRNAs and their potential functions in floral transition, providing a starting point for detailed determination of the functions of lncRNAs in C. bungei. In the early 1990s, a new class of RNA was identified [1–3]; the RNAs in this class, known as non-coding RNAs (ncRNAs), are transcripts that lack protein-coding potential . Based on product length, ncRNAs can be subdivided into two groups: small ncRNAs (< 200 nt), which are mainly microRNAs (miRNAs) and small RNAs (sRNAs), and long ncRNAs (lncRNAs; > 200 nt), which include long intronic ncRNAs and long intergenic ncRNAs . lncRNAs can be divided into three forms based on their effects: miRNA precursors, natural antisense transcripts (NATs), and lncRNAs that bind with miRNAs to sequester the regulatory roles of miRNAs on their target genes. High-throughput genomic technologies have advanced our understanding of lncRNAs in the last decade. However, most studies on lncRNAs have concentrated on animals, and few studies have been performed in plants [2, 5]. To date, lncRNAs have been studied in only some plant species, mostly vegetables or herbs, but also several woody plants [6–8]. In plants, lncRNAs are considered important in fertility , fruit ripening , DNA methylation [10, 11], flowering time [12, 13], and photomorphogenesis . COLDAIR and COOLAIR are the most well studied lncRNAs in plants [12–16]; they participate in the repression of Flowering Locus C (FLC) during vernalization in Arabidopsis and are involved in flower transition . 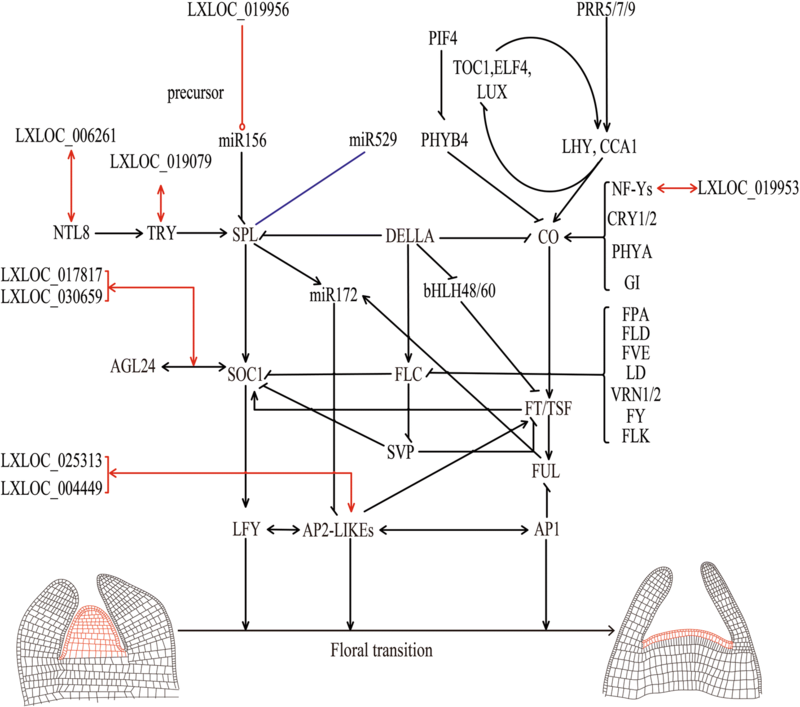 However, few studies on lncRNAs related to floral transition in woody plants are available. Catalpa bungei (family: Bignoniaceae) is a valuable timber material also used in Chinese medicine. Furthermore, C. bungei is famous for its beautiful flowers and is an ancient ornamental woody plant widely distributed in the middle and western regions of China. C. bungei typically experiences its first floral transition in trees that are five years old or older. However, an early flowering (EF) variety undergoes flower transition in the first year after planting. Here, we used this EF variety to study the lncRNAs expressed during the transition from vegetative growth to reproductive growth in C. bungei with plants provided by the Henan Provincial Department of Forestry (http://www.hnly.gov.cn). The Illumina Hi-Seq sequencing platform was used to further investigate the genes and lncRNAs involved in floral transition. In the present study, a comprehensive analysis of lncRNAs and mRNAs from EF and normal flowering (NF) varieties during three development periods was performed. A total of 680 differentially expressed genes (DEGs) and 817 differentially expressed lncRNAs (DELs) were identified during the initiation of floral transition. Further analysis indicated that lncRNAs show several distinctions from mRNAs. For example, numerous lncRNAs are precursors to miRNAs and many lncRNAs regulate protein-coding genes’ expression. This study provides fundamental information to aid future investigations of floral transition in C. bungei. This is the first study to identify and characterize the lncRNAs present during floral transition in woody plants. C. bungei is a perennial tree that typically flowers after seven years. However, a natural EF variety of C. bungei that flowers after one year was found in Henan Province, China, and was used to create a new variety, “bairihua”. From February 28 to March 31, 2016, we collected the first round of axillary buds of EF and NF varieties every one to two days. The samples used for RNA extraction were washed with distilled water, frozen immediately in liquid nitrogen, and stored at − 80 °C. Samples for histological analysis were fixed in formalin: glacial acetic acid: 70% ethanol (5:5:90 vol. ; FAA) solution under a vacuum for at least 24 h.
After FAA fixation, the samples were dehydrated according to the methods of a previous study [17–19], processed with three changes of 100% paraffin at 63 °C, and finally embedded. The paraffin-embedded material was cut into 10-mm-thick sections (RM2255 Fully Automated Rotary Microtome; Leica, Germany), and the sections were stained with Safranin O and fast green FCF (Sigma-Aldrich, USA) . The slices were observed and photographed using a Nikon D3000 camera, a Leica M205 FA fluorescence stereo microscope, and a Leica DM 6000B fully automated upright microscope (Leica Microsystems GmbH, Wetzlar, Germany). Total RNA was isolated using the Spectrum Plant Total RNA Kit (Sigma-Aldrich, USA) following the manufacturer’s protocol. Total RNA quality was monitored by ultraviolet spectrophotometry (NanoDrop 8000 Spectrophotometer; Thermo Scientific, USA). First-stand complementary DNA (cDNA) was synthesized using the First Strand cDNA Synthesis Kit (TaKaRa, Japan) following the manufacturer’s instructions. The EF and NF buds were grouped into three developmental periods according to the histological analysis. Three replicates were included for each period. Libraries were constructed using the second-generation TruSeq Stranded RNA Kit (Illumina Inc., San Diego, USA) following the manufacturer’s recommendations. In total, 18 cDNA libraries, which were sequenced using an Illumina Solexa sequencer, were constructed. To assess the quality of the RNA-sequencing (RNA-seq) data, each base in the reads was assigned a quality score (Q) with a Phred-like algorithm using SOAPnuke software (http://soap.genomics.org.cn/) . Transcripts were assembled and merged using Cufflinks software according to the software instructions . The initial assembled transcripts were compared to known C. bungei transcripts using Cuffcompare software [22–24]. High-quality assemblies with lengths ≥200 bp were retrieved. Three prediction programmes, CPC (http://www.mybiosoftware.com/cpc-0-9r2-assess-protein-coding-potential-transcripts.html), txCdspredict (http://hgdownload.soe.ucsc.edu/admin/jksrc.zip), and CNCI (https://github.com/www-bioinfo-org/CNCI), were used to predict the protein-coding ability of the transcripts [22–24]. Score thresholds were set to distinguish lncRNA from mRNA (CPC threshold: ≥ 0 = mRNA, < 0 = lncRNA; txCdspredict threshold: ≥ 500 = mRNA, < 500 = lncRNA; CNCI threshold: ≥ 0 = mRNA, < 0 = lncRNA) . Transcripts that could be aligned in the protein database Pfam were predicted to be mRNA, while those that could not be aligned in Pfam were predicted to be lncRNA . Transcripts reported as lncRNAs by at least three of the four above prediction methods were identified as lncRNAs. DEL target genes were identified based on their trans-regulatory effects using sequence complementary analysis, as described previously. To explore whether lncRNAs function as miRNA decoys, the lncRNAs were submitted to the psRNATarget server (http://plantgrn.noble.org/psRNATarget/) with an expectation value < 3. lncRNAs containing no more than four mismatches and G/U pairs within the lncRNA and miRNA complementary regions were considered miRNA targets. lncRNAs regulate target genes via proximal (cis) or remote (trans) control. lncRNAs were identified as cis if they were located upstream of the mRNA or within 20 k downstream. Beyond this range, trans lncRNAs did not rely on the locational relationship, and the binding energy had to be calculated. RNAplex software was used to analyse the binding energy of the lncRNAs and mRNAs. If the binding energy was < 30, then the lncRNA was identified as trans and the mRNA adjacent to the lncRNA was screened as its target gene. Spearman and Pearson correlation coefficients were used to screen target genes, with eligibility as a target defined by a Spearman correlation coefficient ≥ 0.6 and a Pearson correlation coefficient ≥ 0.6. To identify lncRNAs acting as precursors of known or novel miRNAs, lncRNAs were aligned with precursors of known miRNAs in the miRBase 21.0 database (http://www.mirbase.org/) with the NCBI Basic Local Alignment Search Tool (BLAST; https://blast.ncbi.nlm.nih.gov/Blast.cgi) using the default parameters. 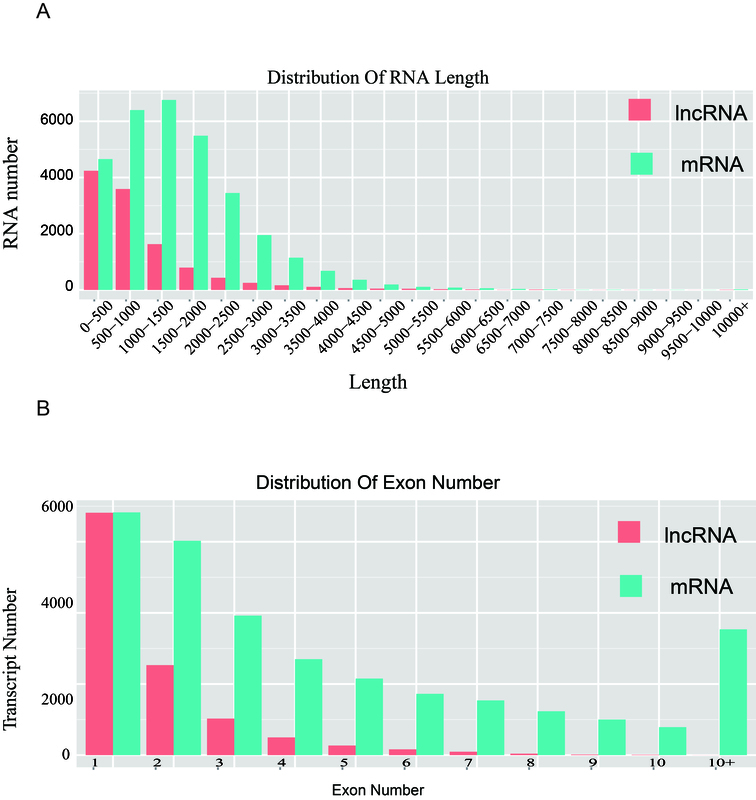 lncRNAs homologous to miRNA precursors with > 90% coverage were defined as miRNA precursors. The expression levels of all transcripts, including lncRNAs and mRNAs, in the NF and EF buds were quantified as the fragments per kilobase of exon per million fragments mapped (FPKM) using the Cuffdiff programme from the Cufflinks package [24, 26–28]. The multiread and fragment bias correction methods embedded in Cufflinks were adopted to improve the accuracy of expression level estimations. DEGs were identified using the DESeq package with an adjusted P-value of 0.01 and a fold change of at least 1.2 . 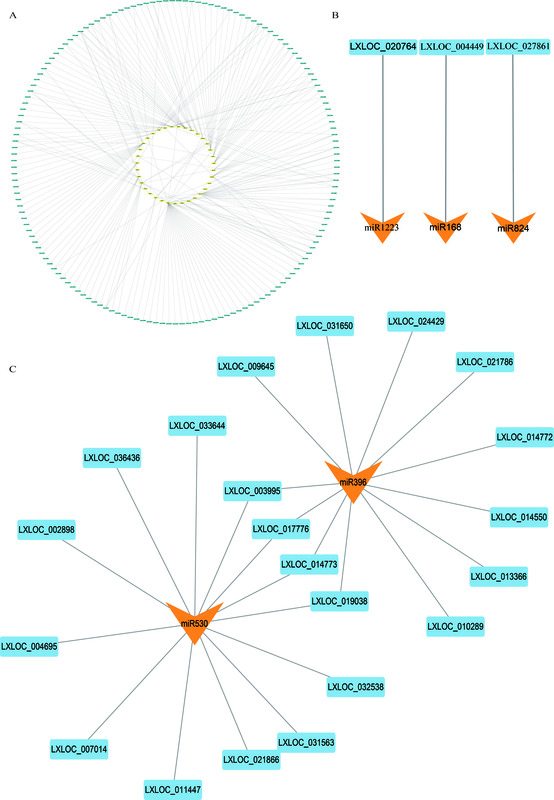 To better annotate and understand the functions of the predicted lncRNAs, the lncRNAs were classified into different families according to their evolutionary ancestor using the Rfam database (http://rfam.xfam.org/) and INFERNAL software (http://eddylab.org/infernal/) with the default parameters [24, 25, 29]. Smaller P-values were associated with greater enrichment of the candidate genes in a given function theme (https://en.wikipedia.org/wiki/Hypergeometric_distribution). Arabidopsis genes related to floral transition were obtained from previous studies [30–36]. The gene sequences were downloaded from The Arabidopsis Information Resource (http://www.arabidopsis.org/). The putative orthologue pairs from Arabidopsis were analysed using BLAST . Based on the data obtained from BLAST, we identified the homologous genes of interest in C. bungei (Additional file 1). Total RNA was extracted using an RNA reagent kit (RN38; Aidlab Biotechnology, Beijing, China) according to the manufacturer’s protocol and were treated with RNase-free DNase I (Takara, Dalian, China) to remove genomic DNA contamination. The qRT-PCR analyses were conducted with a 7500 Real-Time PCR System (Applied Biosystems, CA, USA) using the SYBR Premix Ex Taq Kit (TaKaRa, Dalian, China) following the manufacturer’s instructions. Relative expression levels were calculated using the 2–ΔΔCt method. Cbu-actin and U6 were amplified as an endogenous control . All the primers are shown in Additional file 2. We test the correlation of expression (CEG) between lncRNAs/miRNAs and lncRNAs/mRNAs by using the Pearson correlation coefficient. The Pearson correlation coefficient was calculated by COR() in R .
The stranded RNA-seq datasets are available in the Sequence Read Archive database in NCBI (accession number: SRP120718). The major distinguishing characteristic of the EF variety is its one-year juvenile period; in contrast, the NF variety has a minimum juvenile period of five years. To study the external and internal morphologies of EF and NF buds in different growth phases, we collected buds from two-year-old EF and NF plants. Changes in bud appearance were recorded and paraffin sections were produced to observe the internal morphologies of the buds in the corresponding stages. In the early stage, the buds from the EF and NF plants were vegetative buds (Vbs). Although the EF-Vbs were generally larger than the NF-Vbs (Fig. 1a, b), no differences were observed in the sections (Fig. 1c, d). With continued plant growth, the NF buds generally became longer and thinner than the swollen EF buds (Fig. 1e, f). Conversely, the internal morphologies of the buds in this stage differed substantially. The apex in the NF buds bulged, indicating that they were still in the vegetative growth stage (Fig. 1g). In comparison, a flattened generative apex, which marked the floral transition, developed in the EF buds (Fig. 1h), which were considered transition buds (Tbs). The morphological differences between the EF and NF buds became more evident over time. The NF buds remained in the vegetative stage, with elongated leaf primordia (Fig. 1i, k), whereas the EF buds developed into reproductive buds (Rbs) that had completed the transformation from vegetative growth to reproductive growth and had begun differentiation into the flower primordia (fl) (Fig. 1j, l). Notably, even though floral transition was never observed in the NF buds, the NF buds collected in the period corresponding to floral transition are henceforth called Tbs or Rbs for convenience. Figure 1 shows the external and internal morphologies of the EF and NF buds in the three growth phases. The appearance of the generative apex marked the occurrence of floral transition, whereas the initiation of the flower primordia marked the completion of floral transition. The results indicated that the early vegetative-reproductive transition only occurred in the EF buds, not the NF buds. The EF and NF samples were divided into six groups according to these results for the following experiments. We performed 150-bp paired-end sequencing on raw reads using the Illumina HiSeq 4000 platform by BGI. The total initial reads were processed with in-house Perl scripts. The reads with more than 0.02% unknown bases, the reads with more than 0.68% adapter bases and the reads with more than 0.17% low-quality bases were removed, yielding 13G high-quality (Phred-like Q20, Q30, and GC content) raw reads [20, 38, 39] (Additional file 3). The reads with more than 0.02% rRNA and the reads with more than 28.74% duplications were removed from the 13G raw reads, yielding 9G clean reads (Table 1). All the following analyses were based on the 13G raw reads and 9G clean reads (Additional file 4). From our data, more than 70% of the lncRNAs and mRNAs were mapped to the C. bungei genome [40, 41]. In total, 12,532 lncRNAs and 26,936 mRNAs were obtained (Fig. 2), with 82.4% of the lncRNA transcripts distributed within the length range of 0–1000 nt, and 74.1% of the mRNA transcripts were shorter than 2500 nt. Most of the lncRNAs (81.4%) contained one to two exons, whereas most of the mRNAs (59.2%) contained three to more than ten (11.2%) exons (Additional file 5) . lncRNAs that matched miRNA precursors with more than 90% similarity were selected as potential precursors of the corresponding miRNAs, and seven lncRNAs were identified. Of these, three were known lncRNAs and four were unknown lncRNAs, including precursors for six miRNA families (miR414, miR466, miR171, miR156, miR2916, and miR160) (Table 2, Additional file 6). To further study the correlations between lncRNAs and miRNAs, we analyzed their CEGs in the EF and NF samples. In-depth research was performed on three of the six miRNA families: miR156, miR160, and miR171. 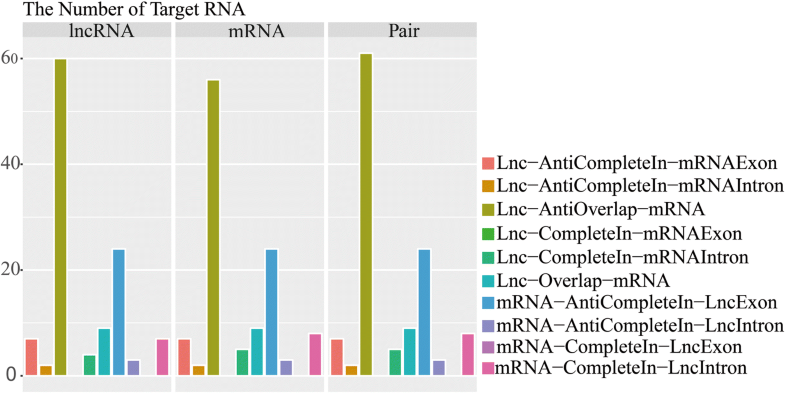 The results showed that lncRNAs and miRNAs have similar positive correlations with r > 0.8 (Fig. 3), implying that lncRNAs may be able to indirectly regulate the floral transition as miRNA precursors. In total, 119 lncRNA-mRNA pairs were identified using this method, including 61 Lnc-Antioverlap-mRNA pairs. Interestingly, these 61 pairs included 60 lncRNAs and 56 mRNAs, indicating that pairing did not occur exclusively in a one-to-one manner. No Lnc-CompleteIn-mRNA exon pairs were found (Fig. 4; Additional file 7). To better understand the roles of lncRNAs, we analysed the lncRNA-mRNA interactions and predicted the lncRNA protein-coding targets (Additional file 7). Seven of the mRNAs were related to flowering: Cbu.gene.18564, Cbu.gene.2167, Cbu.gene.190, Cbu.gene.24144, Cbu.gene.7250, Cbu.gene.20428, and Cbu.gene.1092 (Table 3). To further study the correlations of the lncRNA-mRNA pairs, we analysed the correlation coefficients of lncRNAs and mRNAs between the EF and NF samples during three developmental periods. In-depth research was performed on three lncRNAs-mRNAs pairs: LXLCO_019079/Cbu.gene.1092, LXLOC_017817/Cbu.gene.24144 and LXLOC_030659/Cbu.gene.7250. The expression trends of the mRNAs were highest in EF-Tbs. These results were consistent with the expression patterns of the homologous genes in Arabidopsis [31, 33]. Based on the overall trend, the three pairs exhibited negative correlations with r < − 0.6. While the observed expression correlations between lncRNAs and their co-expressed genes are highly intriguing, whether they reflect true regulatory relationships requires further testing (Fig. 5). In total, 680 DEGs and 817 DELs were identified in NF-Vbs versus EF-Vbs, 1089 DEGs and 1087 DELs were identified in NF-Tbs versus EF-Tbs, and 306 DEGs and 514 DELs were identified in NF-Rbs versus EF-Rbs (Fig. 6, Additional file 8). Fig. 6b shows the numbers of up- or down-regulated mRNAs and lncRNAs. Eighteen DEGs related to flower development were identified in all three groups (Table 4). However, genes regulating the vegetative-reproductive transition were identified only in NF-Vbs versus EF-Vbs. These genes included one SPL gene (Cbu.gene.13552) and two novel genes (Cbu.gene.5215 and Cbu.gene.12342). Cbu.gene.13552, which exhibited greater expression in EF-Vbs than in NF-Vbs, was predicted to be a target of miR529 (psRNATarget, Additional file 9), which is consistent with previous reports of SPL . These results suggested that, although the morphological shift of the floral transition could only be observed in EF-Tbs, the floral transition had started in EF-Vbs at a molecular level. Overall, the Vb phase is a critical stage for floral transition gene regulation. Floral transition has been studied extensively in Arabidopsis thaliana and more than 100 floral transition-related genes have been reported (Fig. 7, Additional file 1). Many homologous genes related to floral transition were found by the BLAST search against the transcriptome data. In addition to the aforementioned genes, several additional genes related to flowering were differentially expression in EF and NF buds (Fig. 8, Additional file 10). Five SPL homologous genes were found in this study, and these genes exhibited greater expression in EF-Vbs than in NF-Vbs. SPLs include very large gene families that mainly promote flowering time via age pathways [43, 44]. SPLs promote floral transition by activating the expression of several other genes, such as FT genes. Cbu.gene.26021 is homologous with genes in the FT family. Cbu.gene.26021 exhibited substantially greater expression in EF versus NF buds at all stages. FT and TSF are FT gene family members that work redundantly to promote floral transition in Arabidopsis . These results imply that FT family-associated flowering transition regulation may exist in C. bungei. The DELLA homologous genes, except for Cbu.gene.10036, exhibited greater expression in EF buds than in NF buds. In Arabidopsis, DELLA is a negative flowering regulation gene that has been found to show lower expression levels in EF buds than in NF buds . Therefore, Cbu.gene.10036 may be the DELLA gene in C. bungei, or DELLA homologs may have a novel role in floral transition in C. bungei (Fig. 8, Additional file 10). The DELs were distributed in 437 families, including 34 known miRNA families (Fig. 9, Additional file 11). These 34 families included 466 related DELs, which may act as decoys of the corresponding miRNAs. The DELs LXLOC_012080, LXLOC_017995, LXLOC_031572, LXLOC_019956, LXLOC_009916, LXLOC_007700, and LXLOC_008874 were related to more than one of the miRNA families miR2118, miR529, miR535, miR408, and miR390 (Fig. 9a, inner layers). In particular, LXLOC_019956 was related to all five miRNA families. These miRNA families are associated with resistance, floral transition, and sucrose metabolism. Most of the lncRNAs were related to unique miRNA families (Fig. 9a, outer layer, B). Together, the DELs and miRNA families formed a complex network to regulate plant development and growth. The relationships between the DELs and miRNA families imply the involvement of plant resistance and sucrose metabolism in floral transition. We performed RNA-seq and qRT-PCR analysis on five lncRNAs and six mRNAs in NF and EF buds from three growth periods (Fig. 10). The five DELs were related to the five flowering-related miRNA families: miR408, miR398, miR529, miR535, and miR159. The six DEGs were SPL, bHLH, LFY, CONTANS, and STP (sugar transport protein). The expression trends can be summarized into three categories. I) The expression levels of some lncRNAs or mRNAs, such as LXLOC_010612, LXLOC_022980, Cbu.gene.21740, and Cbu.gene.21762, showed different trends in the NF and EF buds. In the NF buds, LXLOC_010612, which is related to miR529, was highly expressed in Vbs, but LXLOC_010612 expression was decreased in Tbs, and higher levels of LXLOC_010612 were restored in Rbs. This gene showed the opposite expression pattern in EF buds. In EF buds, LXLOC_010612 showed the highest expression level in Tbs and lower expression levels in Vbs and Rbs. Cbu.gene.21762 was a presumed SPL family gene. No obvious expression changes were noted in NF/EF-Vbs and NF/EF-Tbs; however, in NF-Rbs, the expression level of Cbu.gene.21762 increased sharply. This increase was minimal in EF buds. Cbu.gene.21740 is a bHLH family gene reportedly involved in the jasmonate signalling pathway of plants . From the Vb to Tb phases, the expression of Cbu.gene.21740 decreased in EF buds but increased slightly in NF buds. The different gene expression trends between the EF and NF buds suggest that these genes have a role in the early flowering phenomenon of the EF variety. II) The expression levels of some lncRNAs or mRNAs, such as LXLOC_009916, LXLOC_00700, Cbu.gene.4037, Cbu.gene.14754, and Cbu.gene.21122, showed the same trends in NF and EF buds. III) The expression levels of some lncRNAs or mRNAs showed no obvious trends. Overall, the qRT-PCR and RNA-seq results were in good agreement. The expression levels of the lncRNAs and mRNAs showed period-specific patterns. The mRNAs or lncRNAs that were differentially expressed in the NF and EF buds may contribute to early flowering in the EF variety. C. bungei is an ancient ornamental woody plant in China. The flowering time of this species largely contributes to its commercial value. Floral transition represents a major developmental phase change that transforms the identity of the shoot apical meristem from vegetative to inflorescence. However, partly due to the difficulty associated with selecting the EF buds of C. bungei, few studies have investigated the flowering transition of this species. With the development of RNA-seq technology, genome-wide mapping has proven to be a powerful tool for studying the flowering transition in C. bungei. Here, we present the first comprehensive analysis of the lncRNAs in C. bungei to study floral transition regulation in woody plants. 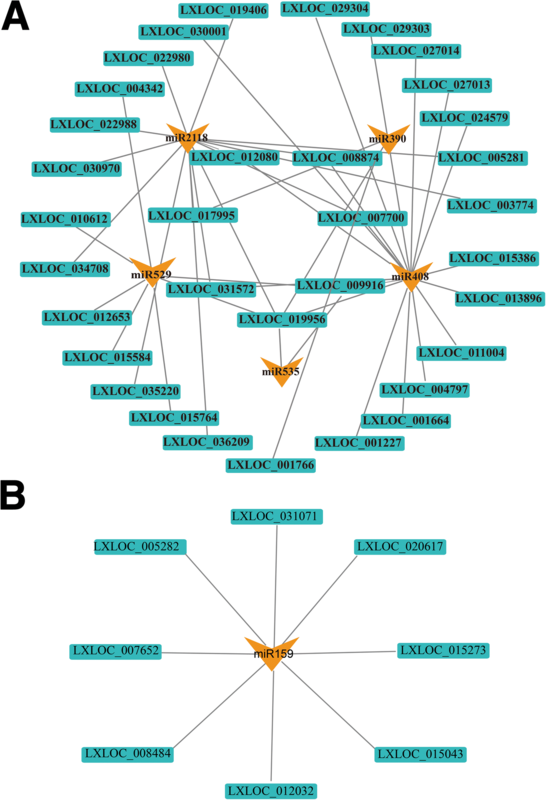 The transcriptomic study was performed with NF and EF varieties to systematically identify the lncRNAs and mRNAs associated with floral transition. In total, 12,532 lncRNAs and 26,936 mRNAs were detected, including 680 DELs and 817 DEGs. Seven lncRNAs were predicted to be miRNA precursors. In addition, 119 lncRNA-mRNA interaction pairs were identified based on localization, function prediction, and binding energy analyses. The results suggest that the molecular regulation of floral transition may occur before the associated morphological changes. 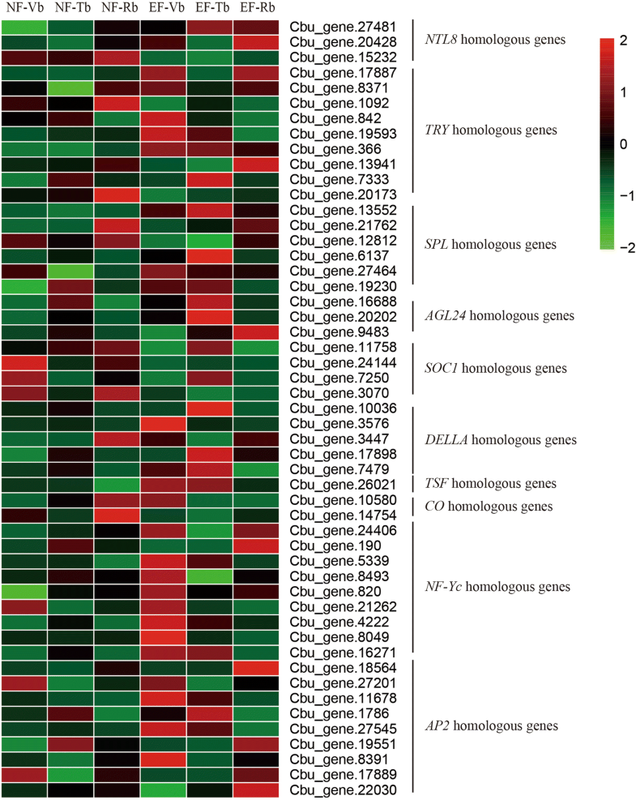 Our results offer a deeper understanding of the floral transition mechanism in C. bungei, and the selected lncRNAs represent potential targets for future studies. In this study, most mRNAs, such as SPL, AP2, LFY, CO, showed expression patterns similar to those in Arabidopsis [30, 34, 36, 37, 48, 49]. Cbu.gene.13552, an SPL homologous gene, generally showed high expression levels in Vbs. In addition, after a short period of decline, the expression levels of this gene increased during the flower formation stage. Cbu.gene.13552 showed expression trends in C. bungei similar to those of SPLs in Arabidopsis (Fig. 8) [35, 43, 49, 50]. However, the expression trends of some genes in C. bungei differed from those of corresponding genes in Arabidopsis. For example, except for Cbu.gene.10036, DELLA homologous genes in C. bungei exhibited greater expression in EF buds than in NF buds. In Arabidopsis, DELLA is a negative flowering regulation gene that has been shown to exhibit lower expression levels in EF versus NF buds [46, 51]. FT and TSF are important genes related to floral transition in Arabidopsis that regulate floral transition in response to day length (Fig. 8, Additional file 10) [52, 53]. Cbu.gene.18536 is a possible homolog of FT, but no differences in the expression levels of this gene were detected between EF and NF buds. Meanwhile, Cbu.gene.26021, a possible homolog of TSF, showed a markedly higher expression level in EF buds than in NF buds. Two main reasons account for these differences in gene expression between Arabidopsis and C. bungei. First, the sequences and functions of genes in herbs and woody plants may differ. Second, because genes from the same family may have different functions, genes may be annotated inaccurately by imperfect genome annotation information. In this study, seven lncRNAs were identified as precursors of miRNAs, including three known lncRNAs and four novel lncRNAs (Table 2). LXLOC_019956 represents a potentially intriguing case. The lncRNA LXLOC_019956 was a precursor of miR156 (Additional file 6). According to existing reports, miR156 targets the SPL family of genes during the flowering transition [35, 43, 49, 54, 55]. 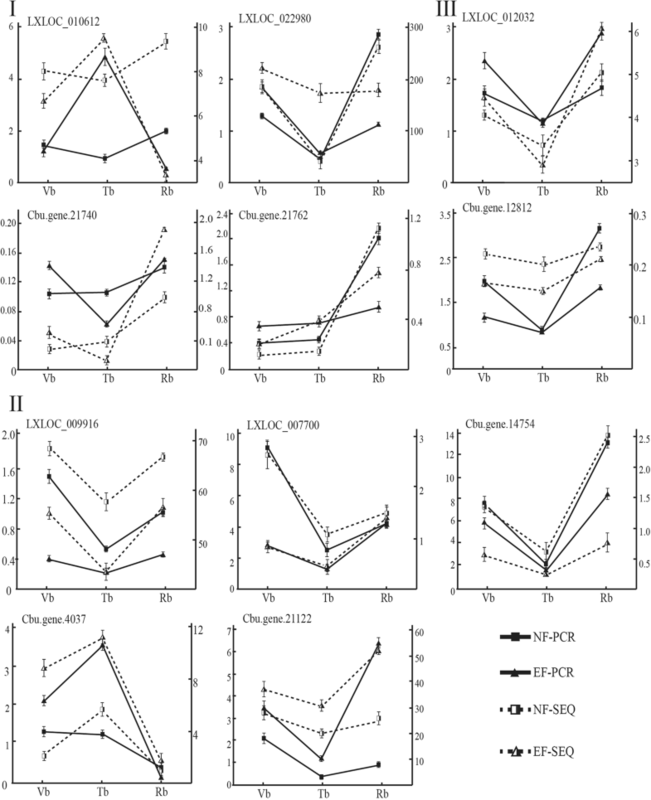 Therefore, LXLOC_019956 may indirectly participate in the floral transition process (Fig. 3). Moreover, LXLOC_019956 is related to miR529/535/408/390/2118, which are crucial for plant growth and resistance (Fig. 9). miR529/535 have a similar function as miR156 [42, 54, 55]. Cbu.gene.13552, a possible SPL gene that was significantly up-regulated in EF-Vbs, was predicted to be a target of miR529 (Additional file 9). Regulation of specific SPLs by miR156 and miR529 is important in flower architecture development in monocots, particularly in grasses. However, in this study, miR529s were present in the eudicot C. bungei. In this study, we identified 119 lncRNA-mRNA pairs (Additional file 7). Seven mRNAs from these pairs are encoded by homologs of genes related to floral transition, including SOC1s, AP2s, NTL8, TRY, and NF-YC (Fig. 7). According to reports, lncRNAs with enhancer-like functions have been discovered, and these lncRNAs also serve as NATs to inhibit the expression of the corresponding mRNAs [21, 56]. Based on the concept that lncRNAs and their regulatory targets may exhibit highly positively or negatively correlated expression patterns, we analysed the expression correlations of lncRNAs and their targets. In our study, we showed three examples of lncRNAs and their negatively correlated mRNAs, including LXLOC_019079 and Cbu.gene.1092 (TRY homologous gene), LXLOC_017817 and Cbu.gene.24144 (SOC1 homologous gene) and LXLOC_030659 and Cbu.gene.7250 (SOC1 homologous gene) (Fig. 5). The three homologous genes promoted the floral transition in Arabidopsis . The identification of three lncRNAs with opposite expression patterns relative to those of their targets warrants further investigation into a possible direct regulatory relationship between lncRNAs and their targets. These results suggest that floral transition-repressive lncRNAs may serve as the hubs of a gene regulatory network, the suppression of which may lead to positive vegetative growth and material development. Overall, lncRNAs have complex functions in organisms. More tests should be carried out to verify the functions of lncRNAs and their mechanisms of action. 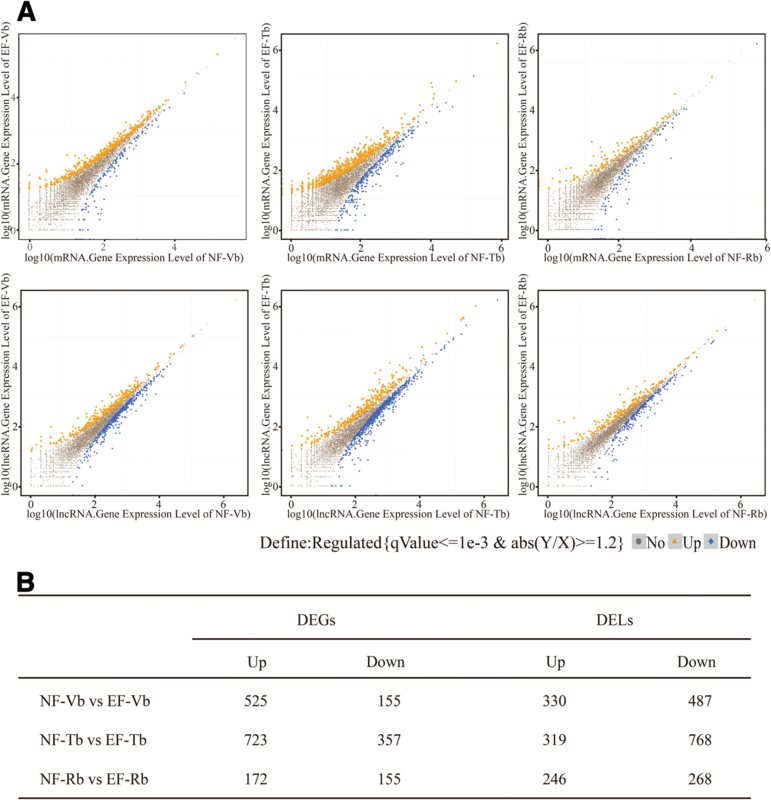 We examined the expression levels of five lncRNAs and six mRNAs by qRT-PCR and RNA-seq (Fig. 10). The expression trends of LXLOC_010612, a bHLH gene (Cbu.gene.21740), and an SPL gene (Cbu.gene.21762) differed significantly between NF and EF buds. LXLOC_010612 was related to miR529, which is important in floral transition. SPLs participate in many biological and metabolic processes, such as resistance and floral transition. The expression results suggested that LXLOC_010612, the bHLH gene, and the SPL gene may be involved in early flowing in the EF variety. However, these genes should be further studied to determine whether they are related to floral transition or flower development. 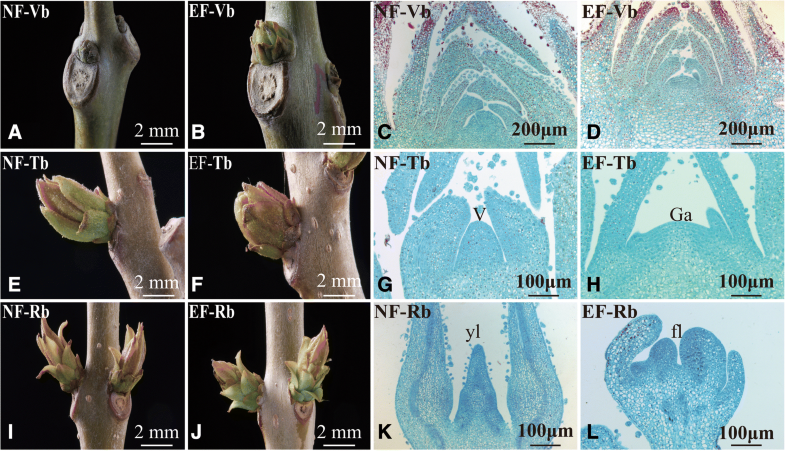 In this manuscript, we recorded the external and internal morphologies of EF and NF buds in different growth phases. In this study, 12,532 lncRNAs and 26,936 messenger RNAs (mRNAs) were detected. 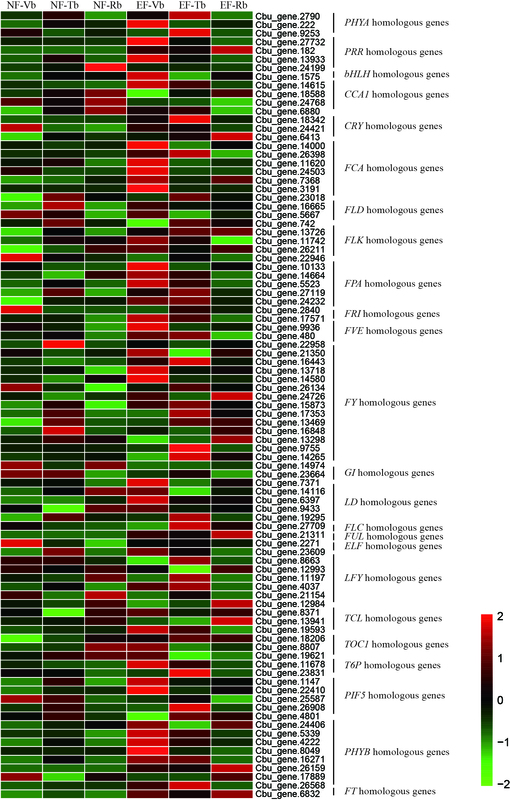 In addition, 680 DEGs and 817 differentially expressed lncRNAs were detected during the initiation of floral transition. Moreover, the lncRNA LXLOC_019956 was a precursor of miR156, which targets the SPL family of genes to enable flowering transition. In addition, seven lncRNA-mRNA interaction pairs were predicted to be involved in floral transition. The present study provides new insights into the role of lncRNAs in the molecular mechanisms underlying the flowering transition. These results can be used to explore the functions of lncRNAs and support further genetic studies of C. bungei. We would like to thank the laboratory for participating in the study. We acknowledge the anonymous referees for their constructive comments on the paper, which have greatly improved its presentation. This work was supported by Forestry Industry Research Special Funds for Public Welfare Projects . The funders had no role in study design, data collection and analysis, decision to publish, or preparation of the manuscript. The complete clean reads have been uploaded to the SRA site (http://www.ncbi.nlm.nih.gov/sra/). Data access: SRP120718 in NCBI. JHW, GZQ and ZW designed the experiments. ZW analyzed the RNA-seq data and wrote the manuscript. ZW and TQZ detected the expression of genes using qRT-PCR. ZW, WJM and NW collected the samples used in the experiment. All the authors have read the paper and agreed to list their names as coauthors. All authors read and approved the final manuscript. All the plant materials used in this study were provided by Research Institute of Forestry, Chinese Academy of Forestry. The field experiments were conducted under local legislation and permissions. Illumina. Understanding Illumina Quality Scores. Tech Note Inform. 2014;1–2. Available from: http://www.illumina.com/documents/products/technotes/technote_understanding_quality_scores.pdf. Yan J, Chia J-C, Sheng H, Jung H, Zavodna T-O, Lu Z, et al. Arabidopsis pollen fertility requires the transcription factors CIT1 and SPL7 that regulate copper delivery to anthers and jasmonic acid synthesis. Plant Cell. 2017:tpc.00363.2017. Available from: http://www.plantcell.org/lookup/doi/10.1105/tpc.17.00363. Li C, Lu S. Molecular characterization of the SPL gene family in Populus trichocarpa. Available from: http://xueshu.baidu.com/s?wd=paperuri:%2863dba9100800d2507dff44b971b28877%29&filter=sc_long_sign&tn=SE_xueshusource_2kduw22v&sc_vurl=http://europepmc.org/articles/PMC4035897/&ie=utf-8&sc_us=16354895411100889434.